For the best part of a decade IBM has been attempting to produce a tiny computer chip with the power of a human brain and the TrueNorth project has just reached a significant milestone. Over the past 12 months, IBM has taken the technology, transformed it and then slimmed it down to what is being dubbed in some corners "the computational equivalent of a mouse's brain". The chips inside the TrueNorth architecture are built to behave like neurons and 48 million of these artificial nerve cells make up the circuit board, according to Wired. That's around the same amount that comprise the brain of a rodent, hence the comparison. Neuromorphic chips, as they are known, are named due to the fact they mimic organic brain cells and IBM is attempting to drive the development of "deep learning" algorithms, which are driven by the cells, through a so-called boot camp at its Silicon Valley R&D Lab. The early results are encouraging. Academics and government researchers taking part in the boot camp have already started to create software that can be used in conjunction with the TrueNorth architecture and drive the internet's AI services of the present and future. This could be anything from Facebook's face recognition to instant translation on Skype. What makes IBM's so much better than the current crop of chips is that they can apparently run these algorithms in a much smaller space that uses less electrical power and therefore lets us stuff more AI onto phones and other tiny devices such as wearables and medical aids. In figures, the IBM architecture uses around 70 milliwatts of energy to power 5.4 billion transistors. To put that into context, modern processors use 35 to 140 watts to power just 1.4 billion transistors. 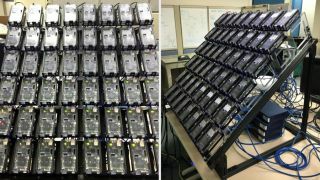 TrueNorth is still a long way away from commercial use and it would seem that the plan to create a similar architecture that has the computing power of the human brain is well on track for 2020.